Since this is a new blog, I thought it would be fun to go back in time and feature some of our more memorable weddings in addition to keeping up with new ones. 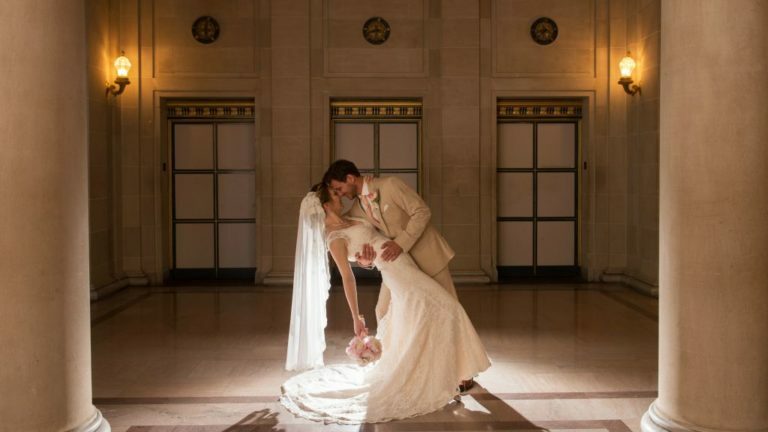 When Toni and I think about past city hall wedding experiences, Robyn and Jeff always come to mind. We probably overuse the term “fun couple”, but with them it totally fit! Neither the bride or groom seemed at all nervous, but they were definitely excited to get married. They had a large gathering of family and friends who watched their nuptials in the Great Rotunda at San Francisco City Hall. After photographing them with with their guests we took them around the building for a fun-filled tour. Robyn knew how to pose for the camera and seemed to be having fun doing it. In many cases, they improvised on our suggested positioning, adding their own personal twist. We have included a photo of them standing in the city hall window, a practice that is no longer allowed on the 3rd floor. SF Cable Car on California Street. Next it was off to Nob Hill to get some Cable Car shots on California street. 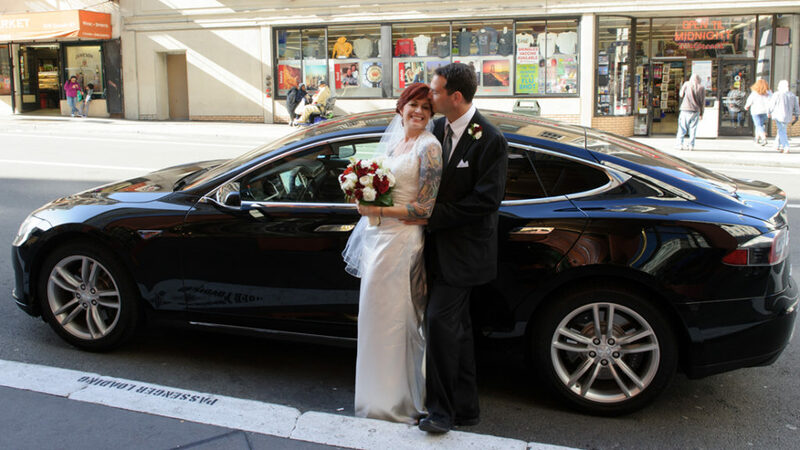 We got an unexpected treat when the newly married couple informed us that THEY would be supplying the transportation and we would be riding with them in a brand new Tesla Model S! Yes, that’s the one with a temporary performance setting that electronically puts out around 700 Horsepower. The car goes from 0-60 mph in under 3 seconds in that mode and we pretty much experienced it on California Street. A fun filled ride ending with some fantastic Cable Car shots. Then we took them closer to Market Street and did some “street photography” with them just walking around. Great stuff and a fun way to end the trip. We really enjoyed our day with Colette and Stephen. 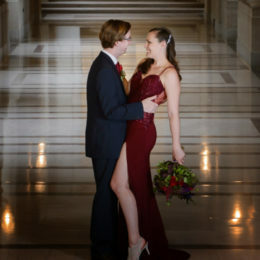 Colette wore a spectacular red wedding dress which had heads turning throughout city hall. The happy couple got married in front of family and friends in the beautiful Rotunda on a typically busy Thursday afternoon at San Francisco City Hall. Fortunately, they choose a very late 3:30 ceremony time and so by the time their wedding was over and the family pictures were complete, things were starting to slow down around the building. We highly recommend late ceremonies to take advantage of the fact that people start to vacate the building as it gets closer to 5:00 pm. This is especially important on busy days at city hall like Thursdays and Fridays. With a fair amount of free rein as we completed our building tour, we were able to get some amazing photos with not too many people around. 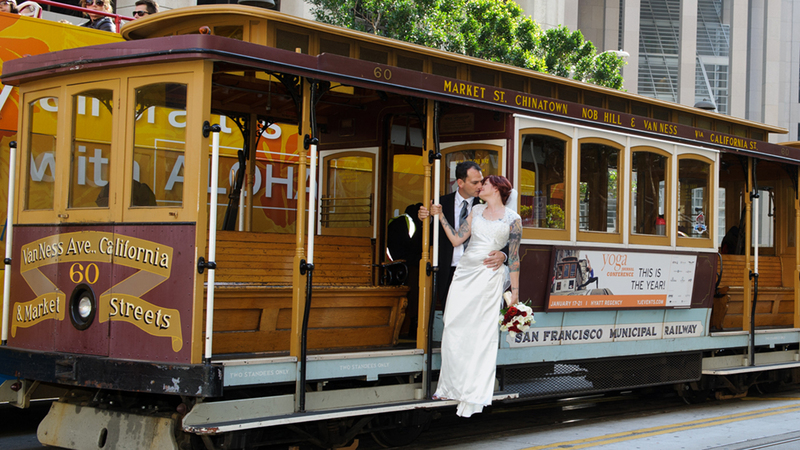 The couple had opted for our very popular Golden Gate package which provides them with 2.5 hours of coverage and 1 location after city hall. 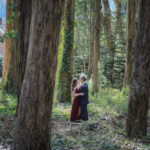 They chose one of our favorite spots for their location, Woodline in the Presidio. Woodline is a deep forest area in the Presidio that has a fairly wide cut-through opening where many trees were taken down. The name Woodline comes from the fact that many of these trees were lined up in a zigzag pattern all the way down the cut-through. We thought that Colette’s dress would work perfectly with the background because of the beautiful red color and as you can see it did! We provided the happy couple with convenient transportation to the Presidio location and then took them to their celebration dinner party. 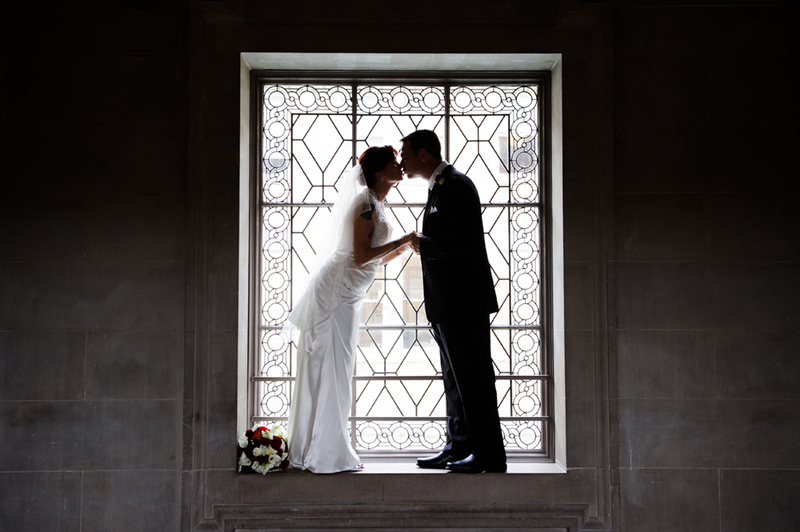 Introducing our new City Hall Wedding Photography blog. It occurred to us that with all of the great times we have had with our couples, it was time to share our experiences. We really try to make our service different by focusing not only on producing great photos, but also making the wedding a great experience. In the coming months we will share some of our wedding fun and focus more on unique things that happen at our City Hall Weddings.